Quetta: The Balochistan Government takes Nutrition on its high priority agenda, the micronutrient deficiencies among the masses and its impact of the health and GDP is a serious concern for the political leadership. This was stated by Mir Rahmat Salah Baloch minister for Health Department) here on Monday. 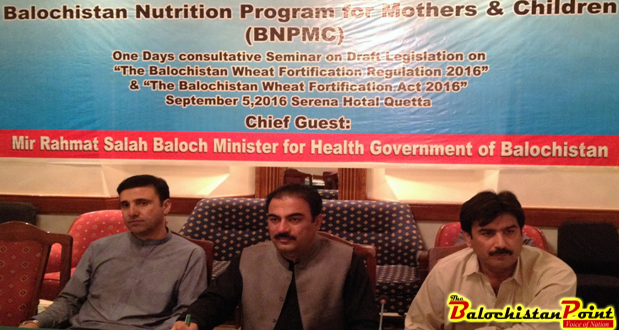 Speaking on consultative seminar on Balochistan wheat fortification legislation organized by Balochistan Nutrition Program for Mothers and Children (BNPMC). Mr Baloch,mandates the ministry to make serious effortsBalochistan Nutrition Program to address the issue of malnutrition.Minister health particularly emphasized the engagement with the private sector including flour millers, civil society, media and the chamber. The private sector can play an important role to address the impact of malnutrition in Balochistan. Whereas, the civil society and media will be helpful to raise awareness on food fortification. He added. Furthermore, he said that necessary legislation will be done so that the staple food items including could be fortify including wheat flour with iron, folic acid and vitamins. Dr. Ruqiya Hashmi, chairperson, provincial standing committee on population and health, said that she strongly support legislation for wheat fortification for the province. She was of the view that food fortification is the easiest and cost effective means to address malnutrition particularly the deficiency of iron among women and children. Dr. Hashmi ensured her support for enactment of wheat fortification act in the assembly. Dr.Fahim Khanprogram director nutrition program, said that the indicators of malnutrition in the province also present very horrific picture. A survey was conducted by Health Department Government of Pakistan and Aga Khan University on mother child health According to this survey 16 percent children are faced with serious nutrition problem while40 percent children fall in low weight category while 52 percent children are smaller in length compared to their age. Dr. Bugti said that 54.9% of women are vitamin A deficient whereas 73.5% children are suffering from vitamin A deficiency. On the other hand 48.9 % of women and 56.8% of children are iron deficient in Balochistan. Earlier the legal consultant of BNPMC has presented draft legislation on “The Balochistan wheat Fortification Act 2016” and “The Balochistan Wheat Fortification regulation 2016”. The prominent lawyers, nutritionists, memes of flour mills association, chamber, representatives of law and food department attended the seminar and given valuable inputs on wheat fortification legislation. Once the draft is finalized that it will be sent to law department for vetting and later on to the provincial assembly for its approval as an act.